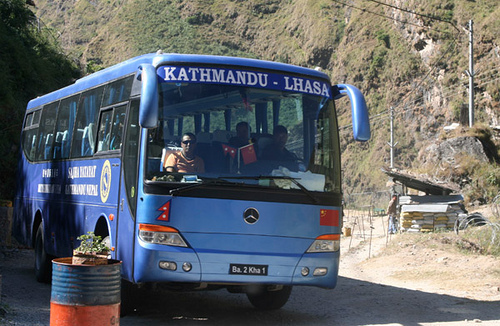 Kathmandu-Lhasa | high road to..
Kathmandu-Lhasa Bus Line Starting ? Tribune carries a story today saying that the Kathmandu-Lhasa bus line will “resume” running , mayhaps within the next few days. The story is the offspring of a weird process : China is said to send a ” a strong message” to India and the world , but this message comes relayed from un-named Indian intelligence sources. The core message is very thin on details : supposedly there was a two day meeting between Nepal Tourism Board and Tibet Tourism Administration some months ago , and a February deadline has been set. The news story has some other points which gives an impression of being penned not in Delhi but Beijing : it describes it as a real change that there is a written agreement between Nepal and China this time , but so there was in 2005 as well. Those of us who follow the Nathu La developments also will point out that we have been waiting for a announced bus line between Gangtok and Lhasa since 2006. China aims at bringing in tourists – European and Indians – into Tibet from the Nepal route. This will mean that China will show “normalcy” in Tibet, a thought that will not find favour with the Dalai Lama, living in exile in India since 1959. This is a odd slant since there never has been a call from Dharamsala to boycott tourism in Tibet , instead tourists have been encouraged to go there and bring back what they see to the world.